For custom barrel makers, honing is a time-saver and cost cutter. A few minutes on a honing machine can cut lapping times in half, leaving a cross-hatched surface finish in single or low double-digit Ra. Honing is the same process used to make diesel fuel injectors with bore roundness and straightness controlled to fractions of a micron (<0.000040″), with surface finish Ra ≤0.15 µm (6 µin). Share the post "High-Tech Honing — Major Advance in Barrel Making"
Have you ever wondered how a cut-rifled barrel is made? This process, used by leading barrel-makers such as Bartlein, Border, Brux, Krieger, and Obermeyer, can yield a very high-quality barrel with a long useful life. Cut-rifled barrels have been at the top in short- and long-range benchrest competition in recent years, and cut-rifled barrels have long been popular with F-Class and High Power shooters. You may be surprised to learn that cut-rifling is probably the oldest method of rifling a barrel. Invented in Nuremberg around 1520, the cut-rifling technique creates spiral grooves in the barrel by removing steel using some form of cutter. In its traditional form, cut rifling may be described as a single-point cutting system using a “hook” cutter. The cutter rests in the cutter box, a hardened steel cylinder made so it will just fit the reamed barrel blank and which also contains the cutter raising mechanism. Above is a computer animation of an older style, sine-bar cut-rifling machine. Some machine features have been simplified for the purposes of illustration, but the basic operation is correctly shown. No, the cut-rifling machines at Krieger don’t use a hand-crank, but the mechanical process shown in this video is very similar to the way cut-rifling is done with more modern machines. “At the start of World War Two, Pratt & Whitney developed a new, ‘B’ series of hydraulically-powered rifling machines, which were in fact two machines on the same bed. They weighed in at three tons and required the concrete floors now generally seen in workshops by this time. About two thousand were built to satisfy the new demand for rifle barrels, but many were broken up after the war or sold to emerging third world countries building up their own arms industry. Very few of these hydraulic machines subsequently became available on the surplus market and now it is these machines which are sought after and used by barrel makers like John Krieger and ‘Boots’ Obermeyer. In fact, there are probably less of the ‘B’ series hydraulic riflers around today than of the older ‘Sine Bar’ universal riflers. Video find by Boyd Allen. Archive photos from Border-Barrels.com. In June 2013, Birmingham Gunmakers Ltd. acquired Border Barrels. Dr. Geoffrey Koble continues to work for Border Barrels, which maintains operations in Scotland. Share the post "Video Animation Shows How the Cut-Rifling Process Works"
“Holy Mother of Mercy…” was this Editor’s reaction when I saw the “screamer” group shot by Forum member Tim Claunch this weekend in Memphis, at the inaugural MSSA 600-yard IBS match. Shooting his amazingly accurate 6BRX Light Gun, Tim nailed a 0.981″ group, centered up for an impressive 50-2X score. Conditions were favorable, with a light 3-5 mph wind and 70° temps. Shooting on the first target, first relay, Tim took his final sighter with 10 seconds to go, then drilled five shots “right down the middle” in about 20-25 seconds. The results were spectacular. Tim’s 0.981″ group works out to 0.156 MOA, and three of the shots clustered in about half an inch! This isn’t a new IBS small group record (Sam Hall holds that record with a mind-blowing 0.699″/50 shot in 2010), but it is still one of the best centered-up groups ever shot in IBS 600-yard competition. Tim was shooting the same 6BRX we featured last month in the Daily Bulletin. It has a 26″ Bartlein 1.250″ straight contour barrel fitted to a Borden action in a Shehane fiberglass Tracker stock. Tim was running Varget powder with CCI 450 primers and pointed Berger 105gr VLD bullets. Tim anneals his Lapua brass after every firing though he does NOT uniform his primer pockets or ream flash-holes. Just how impressive was Tim’s 0.981″, 50-score-value group? Try doing that at 600 yards with wind and mirage and who knows how many little flying insects that might potentially disrupt the bullet… pulling the trigger when the crosshairs are at EXACTLY the same spot (give or take 1/10th the thickness of the crosshairs) EVERY TIME. CLICK Buttons to HEAR Tim Claunch Talk about Shooting his 0.981″ group. With his 0.981″ small group, Tim did take top honors for Light Gun Group. However, he had one shot go wide on another target that raised his Light Gun Group Agg to 2.335″. You’d think that would be good enough to win, but a shooter from Birmingham, Alabama posted a 2.299″ Agg to claim the best Light Gun Agg for the day. Charlie Macke won Heavy Gun group and HG score. The Two-Gun Overall winner was Forum member Stephen Hall. Congrats to all the great shooters at the inaugural MSSA event. Share the post "Wow — Claunch Shoots 0.156 MOA, 0.981" Group at 600 Yards"
Tim Claunch (aka tclaunch) recently put on an amazing display of precision shooting. At an MSSA 600-yard Benchrest Score match in Memphis, TN, Forum member Tim shot six targets in a row, with an average 5-shot group size of 1.677″. Tim’s stellar performance began with a two-target shoot-off for club Shooter of the Year honors (he won). Then Tim shot four more targets as part of the club’s regular 4-target score match. NOTE: this is NOT an official six-target match result. The actual match that day was four (4) targets only, and Tim’s Agg for those four was about 1.8″, still darn impressive. No one is claiming any records here. Still give credit where credit is due — Tim put together six targets in a row, in competition, averaging 0.267 MOA for all six. Tim’s small group (of the six) was 1.351″ and his large group was 2.088″. That shows amazing consistency. This is spectacular shooting by any measure*. Tim shoots a 6mm BRX Light Gun with Shehane ST1000 Tracker stock, Borden Rimrock BR action, and Bartlein 6mm cut-rifled barrel. He uses a Leupold 45X scope in Burris Signature Zee rings sitting on a +20 MOA rail. Tim jokes: “People might laugh at my cheapo Burris rings. Well I guess those Signatures hold zero just fine.” Tim tried a power-booster lens on his Leupold for a while, but this altered eye relief, producing the occasional smack in the forehead. Not surprisingly, Tim removed the booster. For better target resolution, click the gear-shaped icon and select 480p playback. You can learn more about Tim’s amazing six-target display of accuracy in this Forum thread. Registered Forum members can post questions about Tim’s rifle and the shooting conditions, and Tim will answer them when he has the opportunity. * Just for comparison sake, the NBRSA official Light Gun 600-yard, 6-Target (30-shot) Agg record is 2.092″ (Robert Hoppe, 2006). The IBS official Light Gun 600-yard, 4-Target (20-shot) record is 1.6068″ (Sam Hall, 2011). The IBS does not list a LG 6-target Agg record for 600 yards. Share the post "Forum Member Averages 1.677″ for Six Targets at 600 Yards"
Ace UK shooter Vince Bottomley decided he wanted to build a new F-TR rifle for the 2011 season. Vince selected all the best components: Stolle Action, Bartlein Barrel, Precision Rifle & Tool Stock. The build came together superbly, producing a .308 Win rifle that shoots bugholes at 100 yards, and holds sub-half-MOA (or better) to 1000. After building the rifle, Vince decided to shoot Open Class at the 2011 European Championship. So, he graciously loaned his purple F-TR rig to his friend, Stuart Anselm. The rest, as they say, “is history”. Despite having just one day’s practice with the gun, Stuart drove Vince’s rifle to victory, winning the 2011 European F-Class Championship (F-TR division) by a sizable margin. READ Full Story about European Championship-Winning F-TR Rifle. This 2011 Euro Championship-winning F-TR rifle is the star of our latest Gun of the Week Feature Story. In that article, Vince explains how he modified the long PR&T stock to make weight, and how he developed an accurate load with Vihtavuori N150 and Berger 185gr Target Long-Range Bullets. Vince notes that many UK F-Class shooters are moving back to single-base powders, after trying out double-base powders such as VV N550 and Reloder 17. What’s the reason? Barrel life. Vince feels that the single-base powders can give somewhat better barrel life, even if you lose a little velocity. Winning Performance: Scoring 452 points out of a possible 475, Stuart won the F-TR Euro Championship convincingly, finishing 10 points ahead of F-TR runner-up Adam Bagnall (also from Great Britain). Stuart also had the highest V-Bull count with 33. Share the post "Bottomley Builds a Winner — 2011 Euro F-TR Champ Gun"
If you’re wondering what to ask Santa to deliver this holiday season, how about a Quilted Maple 300 WSM Varminter? That’s what Santa brought Barry O. (aka TheBlueEyedBear) last December. Barry, a respected long-time member of our Shooters Forum, ordered a new 300 WSM Varminter in 2009 and it arrived just in time for Christmas. The beautiful rifle, smithed by Richard Franklin, features a BAT Action, Bartlein 30″ barrel, and a stunning Quilted Maple wood stock. Barry’s new 300 WSM is capable of delivering 125gr Ballistic Tips at over 4000 fps, with great accuracy. Barry reports: “Here is my 300WSM Varminter built by Richard Franklin of Richards Custom Rifles. This is one awesome piece of work — And YES, it shoots! I expected a lot when I asked Richard to build this gun, and believe me; I got more than I expected. I am not a machinist, nor am I an engineer, but I can tell you for certain that this is the finest quality work you can expect from a gun builder. Share the post "Dear Santa: Send Me a 300 WSM Ultimate Varminter"
Wisconsin’s Bartlein Barrels currently produces some of the most accurate cut-rifled rifle barrels in the world. We had a chance to chat with Bartlein barrel-makers Tracy Bartlein and Frank Green shortly after the doors opened at the 2010 SHOT Show in Las Vegas. Frank and Tracy weighed in on some of the “hot topics” in the barrel-making business: Gain Twist and the advantages of single-point cut rifling. In this interview, the “boys from Bartlein” discuss current trends in barrel-making, including what’s “hot” in short-range benchrest and the emergence of 7mm barrels for F-Class Open competition. Tracy also offers his opinions on cut rifling vs. button rifling, and he explains how modern technology has helped make modern barrels “better than ever”. 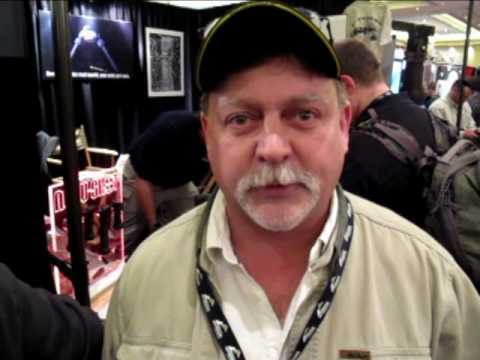 Share the post "SHOT Show Report: The Boys from Bartlein"